The Data Warehouse connector for Google BigQuery automatically syncs the data in your Funnel account to Google BigQuery. 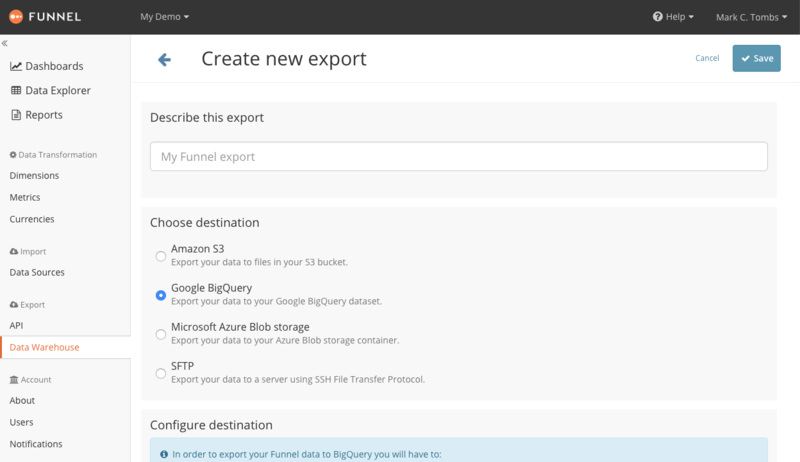 All you have to do is connect your ad accounts to Funnel as usual, set up a BigQuery project with write access for Funnel and enable the upload. Also see "Data schema" below for more details on the structure. Within the BigQuery dataset, Funnel will create one table per calendar month. 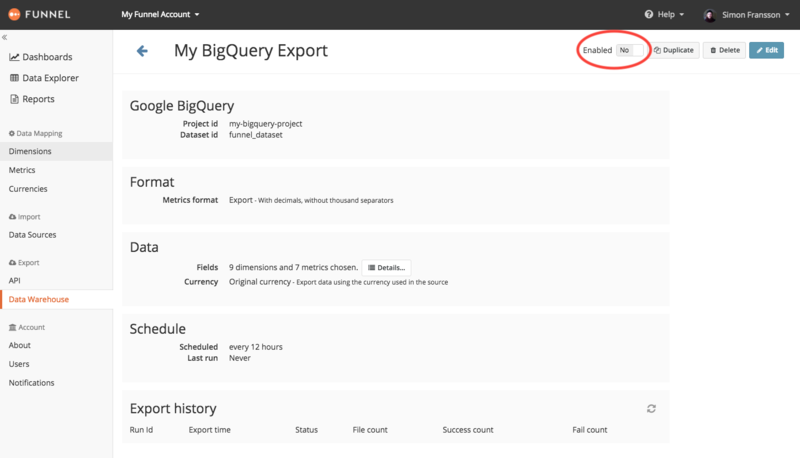 This structure has been chosen to support the BigQuery wildcard queries that should allow you to select all your Funnel data with a single query, or look at only a single month or year more efficiently. Funnel can automatically create a view for you that combines the monthly data. 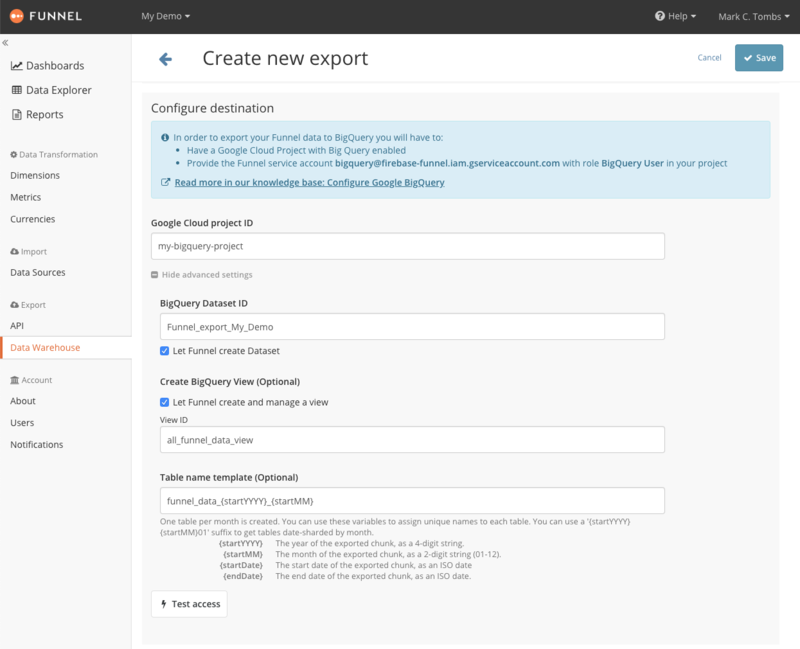 See 'Export configuration' for more on this. To get started you will need to grant Funnel access to your Google Cloud Project. More information on this process can be found in the article Google BigQuery Dataset configuration. 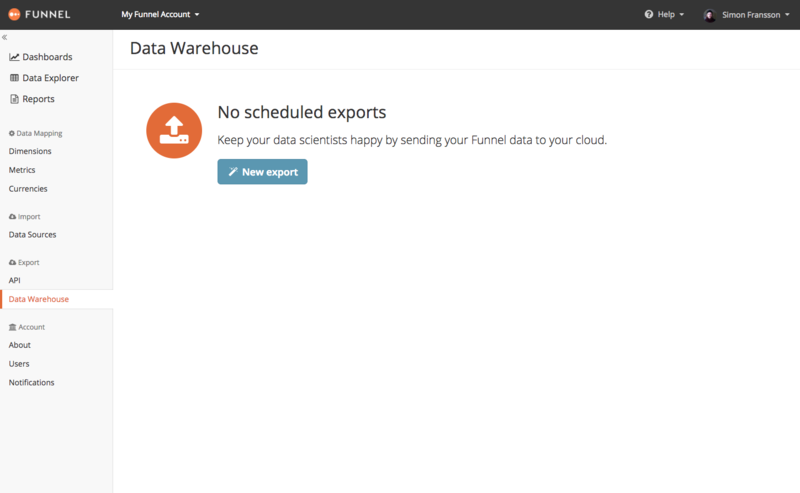 Funnel can automatically create a Dataset for you; this is enabled by default but can be configured. See below for more on this. 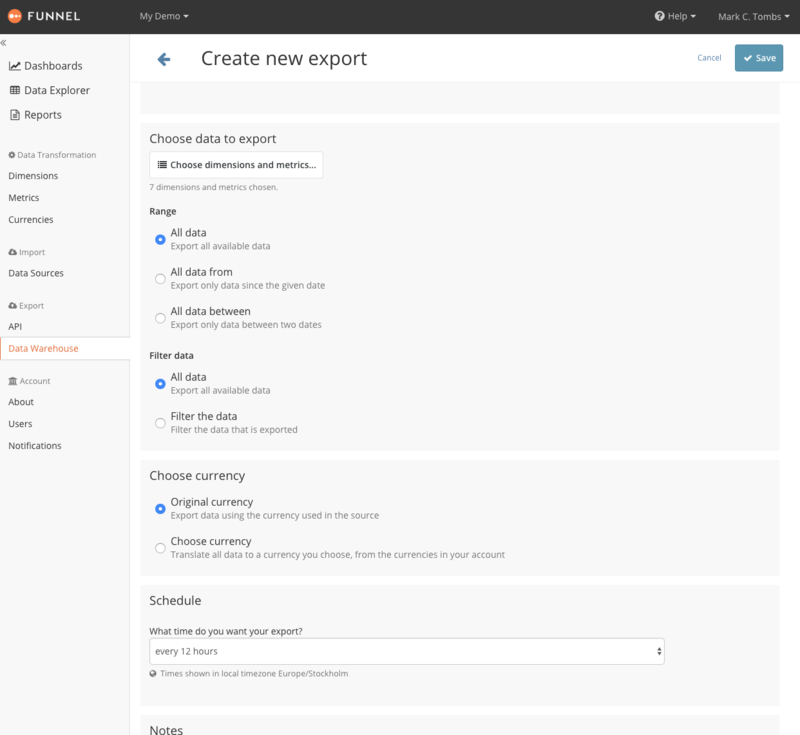 In Funnel open your Account, select "Data Warehouse" in the left hand side navigation and click the "New export" button to setup a new export. 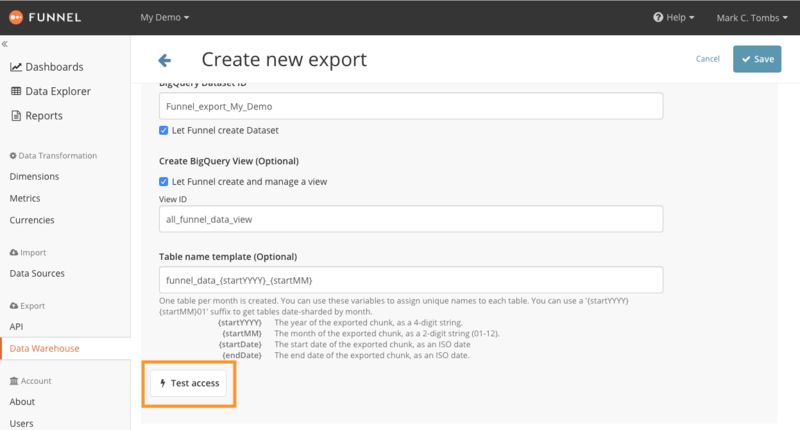 Choose Google BigQuery as the destination for your export and enter a name. Enter the details of your Google Cloud Project. Funnel will, by default, create a Dataset using the name of your account, so for instance with account name 'my Funnel account' the Dataset will be called Funnel_export_my_Funnel_account . This can be configured in Advanced settings. You can also use advanced settings to change the name of the monthly tables. Once you have filled in your details you should verify that everything is correctly set up by clicking the Test access button. Next you should click the Choose dimensions and metrics button in order to select which dimensions and metrics to include in your export. By default all data for all time is exported but you can choose to restrict both the date range and the data by changing the Range and Filter data settings. You can also specify if you want monetary values converted to a specific currency or use the original currency they are reported in. Finally choose a schedule for when the export should be run. Once everything is set up you can review your configuration. If everything looks good you need to toggle the Enable switch in the top right hand corner. The first export will run according to the schedule you specified. In case you wish to verify that everything works as intended you can click the Run now button.